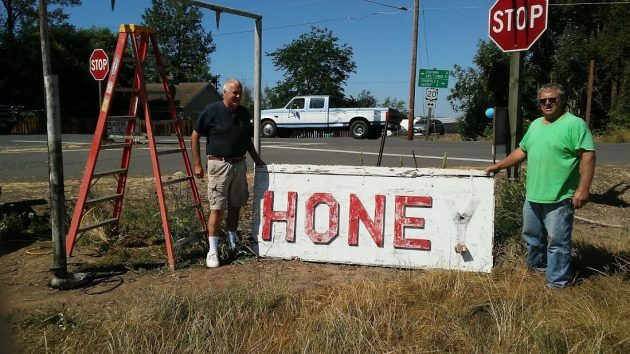 Cecil Powell, left, and Ellis Stutzman with the fabled Honey sign, which is being replaced. I had to turn off Highway 20 on Honey Sign Drive, and on Saturday morning I nearly missed my turn because the sign was gone. Well, not entirely gone, just off the frame that has held it up for two or three generations. On my way back, I stopped the truck to find out what was happening to this mid-valley landmark. As I learned from the men on the scene, Ellis Stutzman and Cecil Powell, what’s happening is that the sign is being replaced with a new one. 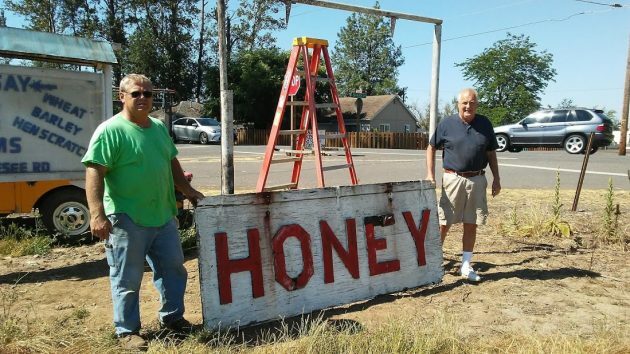 They and other neighbors in the farming country near the intersection of Highway 20 and Honey Sign Drive have taken it upon themselves to replace the weathered sign that’s been a familiar sight to drivers on the Santiam Highway for, in the men’s estimate, at least 55 years. It was there when they were boys. Up close, you can see what decades of sun and rain have done to the plywood backing and letters, even though repairs have been made from time to time. On one side, Stutzman says, the E used to end in an arrow that pointed where honey presumably could be had. The Foress Sign Company in Albany is making the replacement. Powell says it will be made of marine plywood with sealed edges, and the letters will be shaped and attached in such a way that water can’t get between them and the board. Stutzman figures the project is costing about $1,500. He’s gone to the neighbors for contributions, which has yielded $600 so far. And the other sign of this classic among mid-valley road and way-finding signs. Lebanon or 97355. Now we have $700! Did you set up a GoFundMe account? Am I to send you a check? This sign was replaced once before. Why are they taking down the old sign before the new sign is finished?